A few years ago I talked to a Alan Wilks who wrote the book Angelic Wisdom and Light. Alan's book is about angels. Alan explains that not only do angels walk with us , he is sure we all have them around each and every one of us. This Angel man is an inspiration. That is the best way I can describe him. Alan is a bright man who clearly understands the world of our angel counterparts or guides in life. Alan explained to me that each of us is born with angels who help, guide and stay with us during our life on this earth. 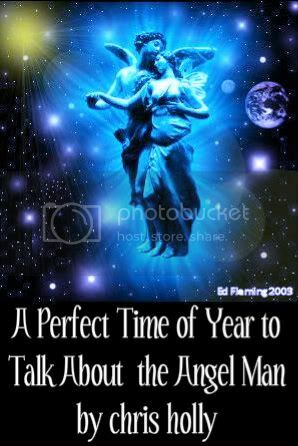 Being a fan of the idea we all have help along the way during our experience on earth I wanted to talk with Alan about the angels during Christmas time. I think we all have encountered times in life we felt confused or lost to find a sudden knowledge come over us so we knew what to do. Some may think this just their extreme intelligence shinning through. I think that intelligence and some of the answers we need in life do come to us by way of our guiding angels. Alan talked with me about the laws of balance in this universe. It is known that we have in all things a positive and negative, a light and dark, a right and wrong, and a good and evil. It seems a opposite of all things is needed to provide balance. Balance seems to be a needed and natural state for life to exist yet it seems to be the very thing we struggle with the most. Humans do not seem to be made to be perfect beings. Humans are made up of good and bad qualities. The trick to being the best human you can be is to keep those things in balance producing a being that is worthy of the spirit it hosts. Alan explained to me that as humans with spirits we are beings who have been given free will. We have been given the ability to choose what we do and how we do it. We have been given the free will to love or hate, to work hard or slack off, be jealous and petty or kind and thankful. We are given the freedom to make these choices each and every day. These choices are also what develops our souls and make us the people we become. If you are a human in balance you are then a soul doing the best with the experience of life. This is a part of Alan's thinking I feel we all need to concentrate on. Do we all use the gift of life in the form of being a human being to become the best we can or do we tend to give in to temptation, private wants and sink to a less admirable creature as we reach for these things?. From what I see of the world around us I think many are sliding along the experience of life rather than working forward to become a better man or woman. "Angels are celestial light created by the source energy some have come to call God, the universe or a higher power. They exist in and around all of us boundless by limitations of time or space. They are eternal in their everlasting missions of running the universe, safe guarding each and every life form throughout- working with fate to bring truth and light via savoring and encouraging hope. I do believe that all ( including other life forms in our universe) are protected and guided by the various angels within the ranks of their chosen choirs. Angels work with us often unseen or unheard. Very few of us have the ability to tune in to the high frequency of our angels to acknowledge their presence unless they choose to be have this happen.. However anyone of us can call upon the service or safety of an angel at any time. There are many methods but the best is often a clear mind with some emotional content and an unwavering faith. Angels will always answer to what is needed not always what is desired. Rest assured they are forever watching over us waiting to be called upon in our hours of need. Angels are neither male or female, they are genderless creatures with no physical true form. It is however our chosen perceptions that allow us to choose what is most comfortable for us, they mirror what we choose to see often at a subconscious level. Through my experiences angels remain shapeless energy constant and consistent throughout. Angels cannot choose the fate of mankind as we were given free will. They intervene when asked or in order to assist. Ultimately it is our choice to make or break the paradise we once had on this planet. We as a race must pull together with the light of angels guiding us to salvation and unity, rather than spread apart through greed or power. Angels can all but stimulate us to motivate ourselves in our chosen paths of life. Angels will not leave those who reject them, they may however stand aside and allow those few to empower themselves and help unnoticed where it is needed. An angel needs no recognition in order to act, they are selfless and loving beings that exist as a lasting light of truth and hope that one day man may find his way home even in the darkest hours. Each of us have our own guardians that stand with us throughout our lives, but there are more and more angels out there watching over all worlds, all life and all above and beyond that which we know. " " I have found speaking aloud in a place of solitude is best when trying to communicate in somewhat a prayer like plea or call. One can also speak within their mind because it is more about the emotional content intended when searching for guidance or communication with angels. To feel deeply and be strong in faith will guarantee you will be receptive to answers given back.. Daily meditations and a sharp mind will increase an awareness of the angels around you. They may give answers through omens rather than directly..such as a billboard advertisement with a slogan appears in your day randomly, confirming your request. It may be another person or stranger appear with comfort you asked for. Answers are always given but very few see or hear them through lack of understanding. Direct answers may be rare but not unheard of. It is more a question of how to become receptive rather than how to ask aloud. Angels are forever listening close awaiting us to reach out for help or guidance. We must allow ourselves to open our eyes to see signs or omens of conformation "
Alan also reminded me that we all need to be thankful to our Angels, or guides for all the blessings and gifts like health, talents and strength. We need to understand that they are there to help us help ourselves, not provide immediate solutions to our problems. Ask your Angels to show you the way out of turmoil. Ask your Angels to give you the strength to reach your goals, but be willing to do the hard work along the way. With all the madness in the world and the heaviness of hate building around us, It would be nice if we all had a good chat with our Angels. Who knows maybe the entire subject of 2012 has to do with our spirits being called back to balance. I sure want to be in close communication with my own Angelic guides. I spend time working with many unknowns trying to deliver warnings and messages by way of my articles to better or protect my fellow humans. Often when attacked for trying to bring truth to the subjects that have been tainted by less than truthful people I wonder if I am doing the right thing. It is then I ask for the guidance of those who may guide me . I admit each time I do this I do receive a reply in some way that urges me to continue to completion my own missions in life . In my opinion when in doubt- go with the light and hope of your Angel guides. They will always show you the way. Blessings from my house to yours during this Special Season. Diane's Extraordinary Life of Missing Time!